It's no secret I love eyelash conditioners. They are my new favorite beauty must have. I also love Peter Thomas Roth, so when the two came together I had to try it out. 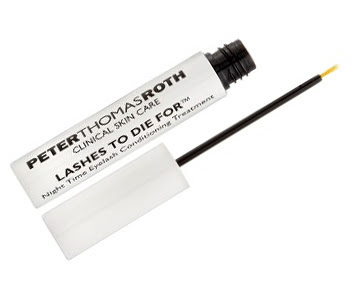 The Peter Thomas Roth Lashes to Die For ($125) is a patent pending complex that helps dramatically enhance the appearance of natural lash length, thickness and fullness. I have never really suffered from small, brittle lashes, but eyelash conditioner only enhances my lashes. 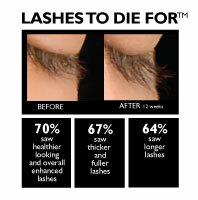 Lashes to Die For will enhance the overall appearance of your lashes. Some conditioners only do one thing I've learned. They either lengthen or thicken, but only a few do both. Lashes to Die For WILL do both. It also works to nourish and strengthen your lashes to prevent breakage. No other eyelash conditioner really does that. Using the conditioner is easy, once every night after you wash your face and take off your makeup, you just apply a tiny bit to the root of your lashes. Only once a day, for a couple of weeks and you will notice a difference. Yep you heard me right! One winner will win their own Lashes to Die For ($125 value) Woo hoo! To enter, visit Peter Thomas Roth, and tell me something else you're dying for! Good luck beauties! Giveaway will end 10/11/2010. Open to the US only. Winner will have 48 hours to respond to the winning email or another winner will be chosen. No PO Boxes please. I already use some of his products but have never tried the Pumpkin Enzyme Peel. I'm also dying to try the chamomile cleansing lotion! I would love the Lashes to die for MASCARA! I think the pumpkin enzyme peel looks awesome! I would love to try the NEW Instant Firmx. I certainly could use the help, LOL! You are now following Bella's Beauty Spot GFC! "Like" Peter Thomas Roth on Facebook! "Like" Bella's Beauty Spot on Facebook too! i would love to try the instant firmx. Subscriber by Email and confirmed! I like the Power K Eye Rescue. I'd love to try the Anti-Aging Buffing Beads! 1- I follow you on Bloglovin. 2- I follow you on Bloglovin. I really want to try the Mega Rich Intensive Anti-Aging Cellular Moisture Masque! I also love the Un-Wrinkle Foundation! I like Peter Thomas Roth on Facebook! Me and my puny lashes also like the Anti-Aging Cleansing Gel. I would like to try the Firmx Growth Factor Neuropeptide Serum. I'd like to try the NEW Un-Wrinkle Creme! 1. GFC as frugal tumbleweed acres. 2. GFC follower as frugal tumbleweed acres. I would like to try the Pumpkin Enzyme Peel. Lips To Die For Pink Bombshell Lip Balm sounds very cool! I would Love to try the Un-Wrinkle. I would love to get my hands on their AHA/BHA Acne Clearing Gel! I am also dying to try PTR's Unwrinkle Eye! I like Peter Thomas Roth on FB!